Thai Chaba Backpackers i Udon Thani, Thailand: Reservér nu! Thai Chaba Backpackers is a home stay for backpackers, located in one of Udon Thani's best central area. It is near many shopping mall, bars, good coffee shops and Thai restaurants. Bus terminal and Train station can be reached by walk. 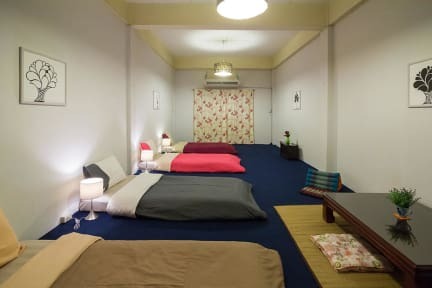 Shared dormitory room with 4 futon beds, accommodate to anyone, whether you are traveling alone or in a group with shared bathroom and toilets. After check in, you can take advantage of on-site facilities, including shampoo & body soap in shower, hairdryer, free tea and coffee. Complimentary wireless Internet access is available to keep you connected. You also have an access to kitchen, refrigerator and microwave. 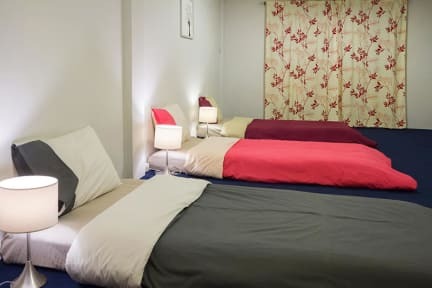 All mattresses at Thai Chaba Backpackers are made from 100% organic materials and feature Thai cotton linen, handmade by the locals. 1. Check-in time is from 2.00pm to 7.00pm. - Please contact me if you are arriving later than 7.00pm. 2. Check out is until 11.00am. 3. Cash (THB) payment only upon arrival. (1) If cancelled or modified up to 7 days before the arrival date, no fee will be charged. (2) If cancelled or modified later, or in case of No-Show, 50% of the balance due will be charged. 6. Desk office hour is from 9.00am to 20.30pm. 7. Please note that all our rooms are non-smoking.